It’s been a while, but then, it’s been a busy year…and I’m writing this from Brazil, where in the next few days we’ll be storming around all over the Pantanal looking for all manner of mega fauna (and avi-fauna by the way!) in the searing heat, and rapidly rising humidity of this incredible wetland. But before I start posting about all things South American, I thought it would be nice to reflect on this year’s ursine encounters…the main ones of which have been in the last two months. With polar bears looming for me on the horizon as usual at this time of year (post Brazil in fact), then it would be remiss of me to not mention their brown, furry compatriots and give them a bit of headline space! 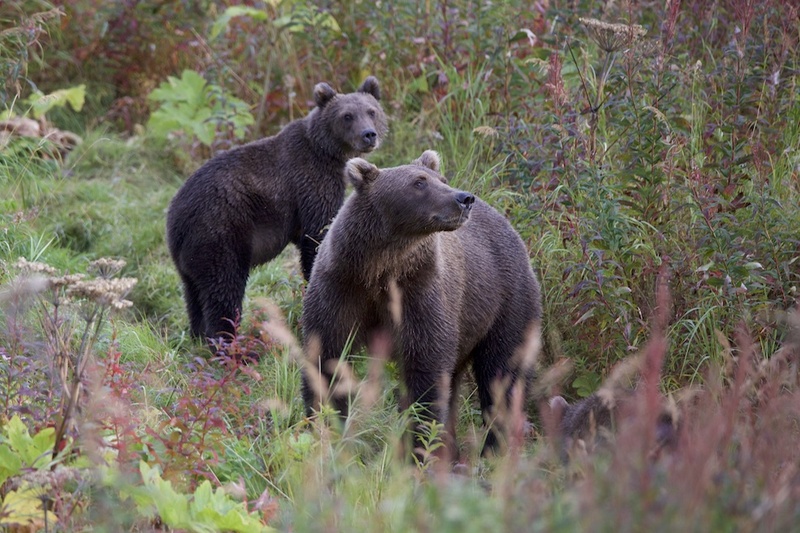 Now, you can see brown (grizzly) bears in a lot of places across North America. Well, I say “a lot” ,but the reality is that for good sightings, their range is considerably restricted. That said, there are a number of excellent places you can go that avoid the crowds, the day trippers, the thousand and one boats and the packed viewing platforms to give you a true wilderness experience, yet still in safety and comfort. We’re not talking small tents and electric fences and holes in the ground for, well, you know…but we are talking exciting locations, surrounded by bears and not a lot else. The camp is run by a good friend of mine – veteran (and I’m sure he won’t mind that moniker, although, to be fair, he’s never really let on exactly how old he is 😉 cameraman, Phil Timpany. Phil has worked on pretty much every documentary to be filmed in Canada over the years, and has a very special affinity with the wildlife of the northwest and bears in particular. The camp he has constructed is superbly sited, and of course, Phil spends the (short) season there filming and documenting the salmon run and the bears and eagles that feed from it. It’s a magical place. The journey starts with a flight to Whitehorse in Yukon Territory, and from there it’s a couple of hours drive to just over the British Columbia border to the hamlet of Atlin. For that two hours or so you see nothing but forests, lakes, mountains and wilderness…although this year I was fortunate enough to have a cinnamon black bear decide to amble across the road in front of me. The whole region is awash with wildlife. Arriving in Atlin, which is, basically, the end of the road, it’s time to park up and board the helicopter. Yep, the only way out of here is the back up the one road you’ve just come down on; a kayak across Atlin Lake (which would be pointless…as there’s nothing anywhere else…) or the helicopter. Some thirty minutes later after skirting mountains and tree tops above ancient landscapes, you can see the Taku river unfold beneath you, and it’s then a matter of simply coming into land on the pebble beach just down from the camp. The fact that this is your way “in” (and “out” obviously!) is the guarantee that no-one else is going to pitch up. There will be no day trippers coming in, no constant buzzing of flight-seeing ‘planes (although I did have a low flying Fisheries helicopter go over when I was there…counting salmon from the air…I mean…really???!) . The site is beautiful – the river meanders past the very front of the camp, from where we have an (unfenced) deck – much like you’d have in a garden at home – to sit on and watch the world go by. When I say “world” I essentially mean bears! Througout the day, brown furry things will amble past the front of the deck, between you and river, and fish right in front of you. They may choose to rub the deck, or even on one of the trees that’s right by it….which is why I love it; I can lay there, metres away from a scratching bear…with all the space I need. It’s incredible. The camp is of course unfenced, but there’s a sort of “agreement” in place; the bears know where they are welcome (mainly their rubbing trees), and we know where we can tread without spooking one of them. 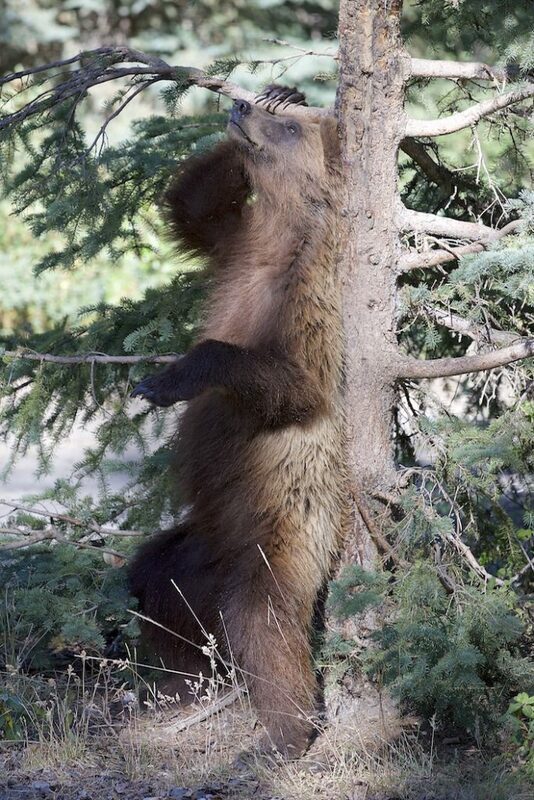 It’s a terrific co-existence, and means you get the chance to capture all manner of ursine behaviour. The days are long – I go (and if you come with me in 2020, so will you!) at a time when sun is up at 5ish and goes down 11ish (p.m naturally! ), meaning that you have a very wide shooting day. This helps massively. Bears are not impala: they do not turn up in the thousand, and as such wherever you are in the world of grizzlies, you can have “fallow hours” where little or nothing happens. The fact you’re in camp though, means that an amble back to the cabin or a walk in the forest (with me and a guide!!!) can break up the day, and of course as well as the viewing site in camp, we have a couple more dotted a few hundred metres along the river. 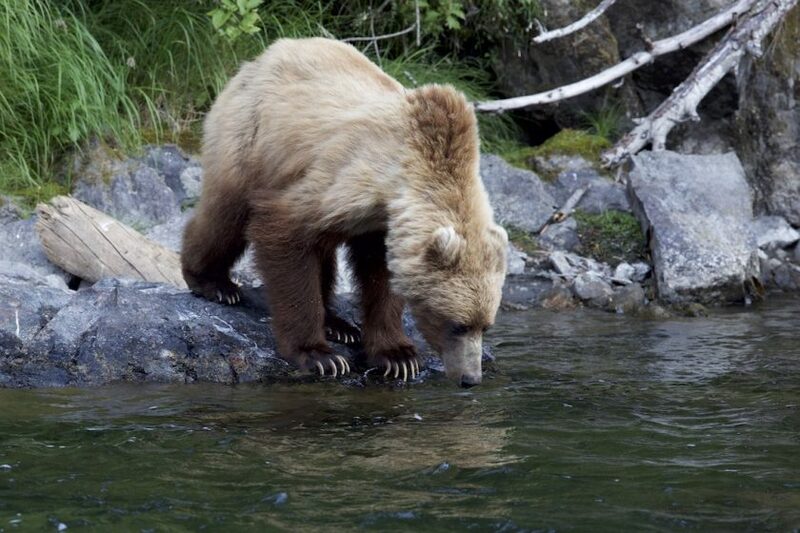 These are superb – giving eye and ground-level opportunities to capture these guys as they amble through, fish, snorkel, play or just “be bears” right in front of you. And when the “day ends” it, well, doesn’t! where we eat is right by the deck, so if anything happens, we’re ready to jump out and get some more shots; there’s no “removal” back to a lodge or camp and – heaven forbid – no squeezing on and off a platform and fighting with a thousand tripods for your one hour in the sun. This is how you shoot bears…..
Whilst the Nakina this year was for my own assignment (a book called “Urso: the art of the Bear” that should be done within the next 2 years), my return to Kodiak was with one of my groups and the grizzly trip I had offered for 2018. We’ll be there again, but not until 2021 as schedules don’t permit it, but rest assured, it’ll be worth the wait. The Kodiak bear is something of a legend. In fact, it was one of the first animals I can remember from my (now somewhat tattered) Hamlyn Animal Encyclopedia. In a drawing – not a picture – within the “bears” chapter (of course….) was this almost mythical, giant bear: I can see the image now (not least because I have the book beside me whilst I write this 😉 ) , but to a seven year old, this incredible icon of the wilderness was something super-special, untouchable even. To see them therefore is something of a major “tick” for any wildlife photographer, or bear viewer come to think of it. They are of course just (and I don’t mean that in any negative sense!) 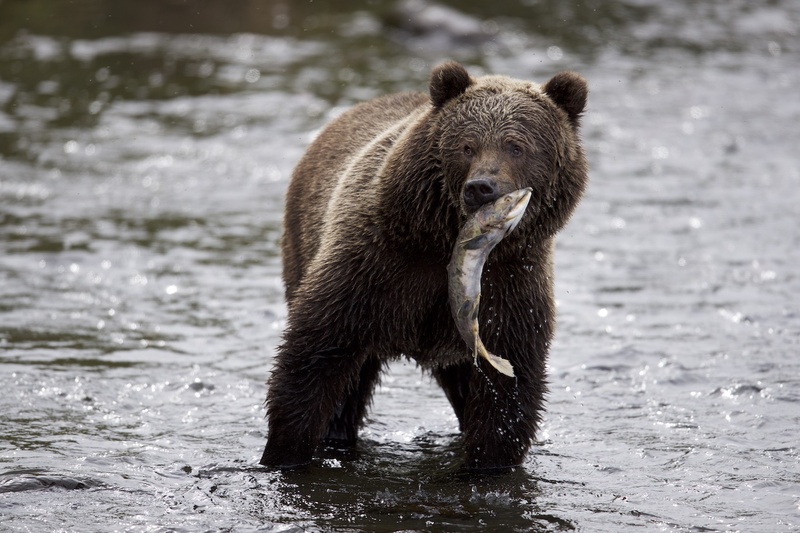 an Alaskan Brown Bear, but thousands of years of isolation on the island of Kodiak has seen these protein-focused brown bears grow into true giants. Indeed, the biggest bears I have ever seen have all been on Kodiak, with some of the males matching up to a polar bear in length and body size. Walking the trails of this fantastic island (admittedly, through “hero” grass…the type of brush that is 2 metres high and obscures all but the narrowest of views as you head through it! ), dodging the bugs (non-biting, mostly, but, well, bloody annoying), you are in some of the most unspoiled wilderness on earth. Some two thirds of Kodiak is devoted to the wildlife refuge, and in it brown bears of all shapes and sizes (although, mostly big) play and live out their lives just being bears – untouched, un-phased and unbelievably peacefully. The place I stay is the Kodiak Brown Bear Centre – a quite remarkable feature of engineering on an island in Karluk Lake. The facilities there are like something of out of Tracey Island (for Thunderbirds fans!) – it has been incredibly constructed, especially given that everything had to be helicoptered in, even the boat we use to get around. The setting is beautiful – especially in the autumn months when the undulating hills and mountains are cloaked in a palette of golds and reds….punctuated only by the odd deer, fox or large, dark brown bear. Yep, the bears on Kodiak are on average darker than the norm – you see fewer blonde ones there, and a lot more chocolate colours. This can be an exposure nightmare sometimes…but all in all, they do look mightily impressive against this incredible landscape. Access to the lodge is by floatplane, and again, there are no day trippers to deal with…you have the run of 117000 hectare area within the Refuge all to yourself, accessing the main viewing areas by boat each day, and then short hikes to viewing areas where the bears are used to seeing you, and therefore don’t freak out. Karluk is a huge lake, and the salmon run here is majestic….not surprisingly providing ample food for fishing bears, and during the short season (all the best things come in small packages remember! ), you can get some incredible photography done. With just 6 people in Kodiak or 8 people at the Nakina, these are two of my most favourite bear viewing areas on earth. Why not join me next time?